Congratulations on your engagement! You have the ring, posted your selfies all over social media and now people are inundating you with questions about your wedding day; where will it be, what is the date, who is in the wedding party? 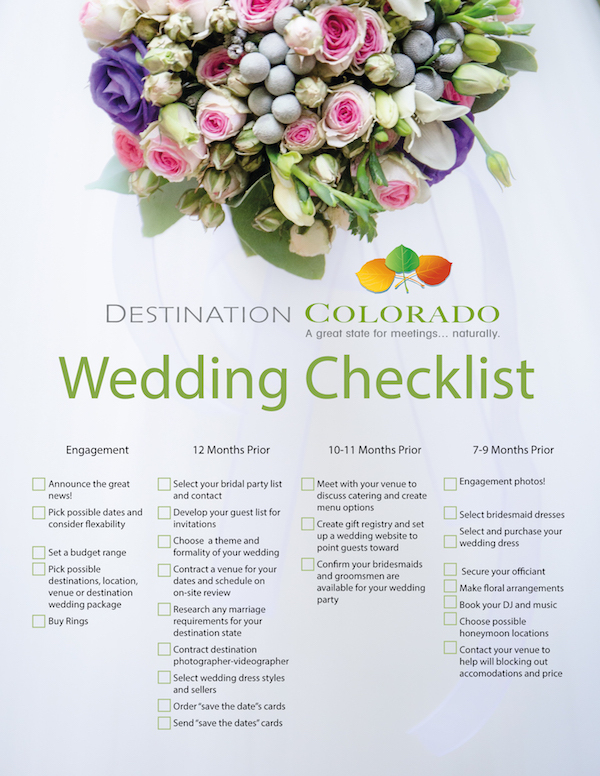 Not to worry, Destination Colorado has carefully curated a guide to ensure that the only “hitch” will be the hand you hold as you say “I do” on your wedding day. Yes, there is a lot of planning to do in the coming months but give yourself permission to enjoy your engagement. Be creative, flexible, and have fun brainstorming ideas. After you announce your engagement, start looking at Colorado destinations and venues as early as possible (keep in mind, your wedding date may have to shift due to the availability of the wedding venue). Colorado has ranked among the top wedding destinations nationwide, and it’s no surprise given its postcard-perfect mountain backdrops including the beautiful bell-shaped peaks of Maroon Bells in Aspen, CO or the breathtaking views of the Rocky Mountains in Estes Park, CO, or Telluride’s San Juan Mountain sunsets. Colorado can accommodate your wedding day vision. As you explore Colorado wedding destinations and locations, continue to think about what wedding style works for you. Do you want elegant ballrooms with marble fountains or do you prefer a ranch-style venue complete with mason jars and rocking chairs? This is the time to formalize your guest list, contract your wedding venue, choose your bridal party (if you are having one), research the marriage requirements at your wedding location, and order your ‘save-the-dates’ to send to your guests. Wedding dress shopping will undoubtedly be exciting and don’t forget to book wedding photographers and videographers early, as the good ones are usually booked months in advance. Once you have chosen your wedding venue, you will want to choose a menu by working with their caterer (if they have a contract) or find one of your own. This is also the time to ask your bridesmaids and groomsmen to be in your wedding party. You and your fiance will also have fun completing a gift registry and adding it to your wedding website. Personal wedding websites are extremely useful in communicating with your guests by providing group updates (instead of sending emails and text messages one-by-one), RSVP’s, and allowing your guests to access your gift registry on their mobile devices. As you consider your reception site, you will want to book a florist and table decorator (or ask some talented friends) to assist you with centerpieces and bouquets. You will also need to arrange music rehearsals to hear musicians or DJ’s before you sign a contract with them. Ask them how many breaks they need and don’t forget to provide them a playlist including your favorite songs. It’s also time to select your bridesmaid gowns and select your wedding dress. Don’t second-guess yourself when it comes to your dress. If you have found the perfect wedding dress, choose it. You don’t want to regret choosing the wrong dress every time you look at your wedding photos for years to come. Speaking of photography, this is a good time to take your engagement photos as well as select a wedding officiant. Contact local hotels to set aside a block of hotel rooms for out-of-town guests and begin researching honeymoon locations (though Colorado has so many magical meadows and shimmering mountain peaks you won’t want to go anywhere else). By now you have booked your Colorado destination wedding venue, chosen your wedding dress, and decided upon a reception menu, music, and table/room decor. Now it’s time to book your airfare to your Colorado wedding destination and encourage your guests to book theirs as well. The 4-5 month mark is also a good time to book your honeymoon (if different than your wedding destination). Your groom and groomsmen will need to select their formal attire and you and your fiance will need to find time to indulge in a cake or dessert tasting for your reception. Don’t forget to book other necessary rentals for your ceremony and reception such as tables, chairs, and linens and place your order for your wedding invitations and paper goods. The next 2-3 months will go by quickly, so this is a good time to check off some of your wedding details such as: making wedding dress alterations, purchasing accessories such as veils, shoes, and jewelry, and buying gifts for your wedding party. To help ensure your expectations are met, finalize details with your vendors and get everything in writing. You don’t want to allow any room for complaints by your “about-to-be” in-laws because there is a shortage of chairs or hors d’oeuvres. If you are having a religious ceremony, this is a good time to finalize readings and music, and you will want to select wedding bands and book your rehearsal dinner as well. Your wedding invitations should include your names, time and place of the ceremony, and reply card. You may prefer to make a note of your wedding website on the invitation but never include your gift registry… it’s just tacky. (TIP: Make sure you have several people proofread your invitations before sending them out). You will surely want to look your best as you near your big day. This is a time to focus on you! Book some trial appointments for your hair and don’t be afraid to try a few hairdos. You may want to hire a professional makeup artist and have them teach you ways to touch up your makeup during the day of your ceremony. You will also want to schedule a final dress fitting to alleviate any concerns and prepare welcome bags for guests. Considering seating arrangements and place cards for your guests for the wedding reception will also buy you some time later. At this point, you want to confirm your hotel reservations and flight details. Call anyone that didn’t respond to your RSVP’s as this will help you provide a final number to your caterer and ensure your seating chart and place cards are accurate. Your wedding dress should be available for you to pickup, and double-check the written details of all of your vendors to make sure they have what you need. You may also go in for your last hair appointment (especially if you color your hair) during this time to help you feel your best during your big day. Consider taking a week away from work before you travel to the Colorado wedding destination you have chosen. This will allow you some breathing room to pack and purchase any last minute needs for your ceremony or honeymoon. It will also give you a little time to enjoy the area before your guests arrive. Next step? Travel to your destination! You will likely be taken away by the breathtaking landscapes and amenities your Colorado wedding venue has to offer, but don’t forget a few last minute details. Doing a walk-through of your ceremony and reception site is crucial to things running smoothly on your wedding day and make time to apply for your marriage license. Scheduling trial appointments for your hair and makeup and having your wedding dress steamed to remove any wrinkles from traveling are good ideas as well. After that? Reward yourself. Give yourself plenty of time to relax and enjoy the area by eating some comforting meals and getting plenty of rest. Can you believe it? The day is almost here. All of your planning and follow-up phone calls have finally paid off! It’s time to book yourself a manicure and pedicure, hold your rehearsal dinner, and visit with family. Resist the urge to triple-check details, get a good night of sleep and just relax. You’ve earned it. The most important thing to remember while planning a Colorado wedding is to not plan the perfect wedding, just the most perfect wedding for you. Whether your wedding pictures include famous Colorado mountain peaks, glacial valleys, or fertile fields, Colorado’s beautiful wedding venues are the perfect backdrop for your perfect day.